Showcasing my full on love for Primark today! I bought all these bits from the flagship store in London, and this has to be my favourite outfit I've worn in a LONG time. Its so cosy and warm, and totally going in the right direction for A/W! I'm trying to opt for a warmer, more subdued colour palette, I'm thinking petrol blues, peacock greens, deep purples, oatmeal, warm browns, burnt oranges and cool greys.I know exactly what look I want to go for this A/W its just a case of finding those right peices! Im very inspired right now, especially after the LOOK show! I know the dress is a little hoochy, but I am wearing cycling shorts underneath to hide my modesty! I'm one of those people who thinks, well as long as my bums covered its fine! Probably a little on the risque side but hey! This scarf is so good too, It "doesn't look like Primark" at all! Ivor actually thought it was from Gap when he first saw it. I love all the colours in it too! My hair is not agreeing with me today! As you can totally tell! Its all puffy on the one side and because I've been mega conditioning my hair (its matted itself AGAIN!) its a bit too fluffy to have in my center part! I do like having the option to do both though! Sorry for a short but sweet post, I'm trying to do a Ask LLYMLRS for this week on what I think makes a good blog, at this point in time it might be a long 'un, so maybe it will come in two parts! I'm not sure what else to do blog-wise at the moment. I feel like its getting a little monotonous with its three outfit posts, sunday portrait (sorry I missed this week guysss!) then whatever I can think of to post about on the other three days. Maybe I need some new features, or resurrect some old ones! Any thoughts? PS. If you have Facebook can you please like the Oasis page, and then "Like" this picture of me! If I get the most likes I'll get a £200 to spend at Oasis! Thanks so much if you do! PPS. PLUS A FEW NEW ITEMS ON THE BLOGSHOP! That cardi is perfect! I really want one in that colour, I'll have to look out for it. 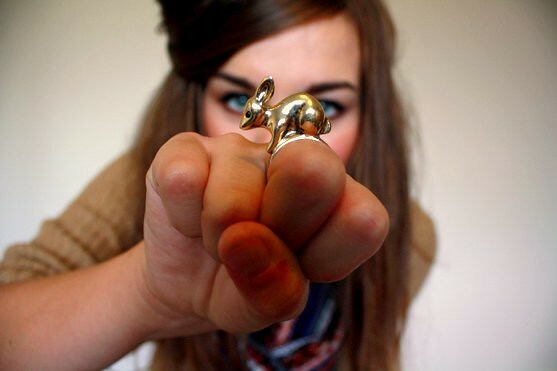 I love the bunny ring as well, I'm always so tempted to buy it when I see it. I've got that cardigan! I love it so much, so big & snuggly. & surprisingly goes with anything, any colour. Looking forward to the next Ask LLYMLRS! p.s. kudos to the cuppa! The best accessory ever. whooaaa! the ring's so cool!! love it! and the dress is cute. you are so incredibly, gorgeously photogenic. i need to get to primark soon, there isn't one in edinburgh, the cardigan looks fab on you lily! I dont know why but I just look stupid in Primark clothes which is a shame as they are all i can afford at the moment. I looove your cardigan! I really want to invest in some of those for winter- was that from Primark aswell? How much was it? ps. relatively new reader to your blog - i love it, british blogs are always best... not that i'm biased, ahem. I bought that exact cardigan from primark yesterday, couldn't believe it was only £7! They seem to have put their prices up, so it came as a bit of a shock. haha, a slighlty over-enthusiastic post i might add, lol. I love this look! That scarf is perfect for fall! Love the outfit, wouldn't have guessed it was all from Primark! If you are having problems with your hair getting matted, have you tried a tangle teaser before? They cost about £10 from boots, but totally amazing on knotted hair! Haha it's so weird that I have pieces VERY similar to each of these but none of them Primark! I woulda never thought to put this outfit together, NICE POST! You look beautiful. I love the whole outfit, the dress is too short for me but I want the cardigan and scarf. I really like the hair too. I need to get myself down to Primark! I swear I never find anything like this when I go! It would be amazing if you started posting more of your graphic design stuff again. All those old posts are so interesting with your moleskin notebook scans. I'm a massive lover of typography so I really enjoy all of that. Also, totally surprised me when I found out you're from Ludlow, I used to work in the Tesco (whoopee :/)and live like 20mins away. I'll say hi if I ever see you around! I'm loving your cardigan! You always look so lovely and adorable! i lovee the ringg!! adorable!! You look gorgeous and that outfit is too cute! Your hair makes me jealous! lol is your boyfriends name on your top in the first pic? I have that cardi in Navy and i also picked up the snood, there so nice and the snood is so soft def not something you would think is from Primark. I have that cardigan in grey, it is so warm! Love the dress! If you are not comfortable with this that is fine...is why wanted to ask before? I would also love to exchange links?